An exhibition of photographs documenting three decades of the London and New York art gallery party scene taken by society photographer Dafydd Jones opens at the Idea Generation Gallery in Shoreditch, London this Friday 7th October. My little publicity machine: Ali Hewson and Bono publicise the work of Damien Hirst at Sotheby’s, London in 2008. Photo © Dafydd Jones. Since he began photographing society events for Tatler and Vanity Fair in the 1980s Dafydd Jones has been documenting the changing world of art gallery parties. Now, for the first time an exhibition of Jones’ photographs reveals the transformation that has taken place as art gallery openings in London and New York evolved from polite drinks parties to brash media events overseen by heavyweight corporate sponsors. Art world names photographed by Jones include Tracey Emin, Damien Hirst, Jay Jopling, David Hockney, Nicholas Serota, Gavin Tuck and a usually camera shy Lucian Freud. Robert Mapplethorpe’s last birthday party, New York, 1986. © Dafydd Jones. 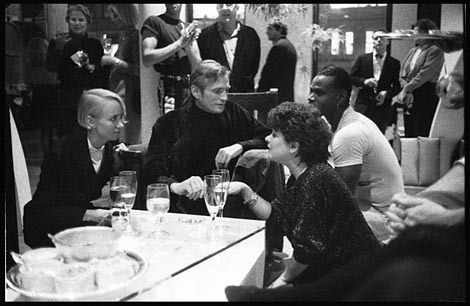 In 1988 Vanity Fair sent Jones to cover what turned out to be Robert Mapplethorpe’s last birthday party. Mapplethorpe was very ill and clearly didn’t have long to live. He was surrounded by a small affectionate gathering of downtown friends, including some of his models, Susan Sarondon and Tama Janowitz. Sensitive to the moment Jones turned his flash off and took a few gentle pictures on uprated film. When Vanity Fair used a harsher picture by Jonathan Becker taken at an earlier party to illustrate the feature, Jones put the Becker picture on his wall as a reminder of his failure to ‘get the shot’. After living with it for a few years Jones decided that he didn’t like the Becker picture anyway. When he returned to the contact sheets this one (above) still stood out. A gentle eye and non-exploitative approach has led Dafydd Jones to become an integral part of major gallery openings and society events. With previous one man shows in New York, Detroit, Bristol and London, Scenes from the Art World will be his second one man exhibition to hit London. The first, High Society, was shown at the Proud Galleries in 2002. Prints of Dafydd Jones’ work from Scenes from the Art World can be purchased from the Idea Generation Gallery. His printers are Genesis Imaging of Fulham. Scenes from the Art World 30 years of Gallery Culture by Dafydd Jones is at the Idea Generation Gallery, 11 Chance Street, Shoreditch, London E2 7JB from 7th to 16th October 2011. Open 10am – 6pm Monday to Friday, 12 – 5pm Saturday and Sunday. • Dafydd Jones: My life as a society photographer, an audio slideshow by fellow EPUK member Nick Cunard, is at The Guardian online.